Conflict on projects is totally normal. You should expect people to disagree. We're all different, and it’s the differences that make our teams highly performant. The discussions that happen when people disagree can result in some incredibly creative and inspiring solutions to issues. Disputes help people unpick the real problems and dig down to the root of what is going on as they try to frame their own personal arguments. In other words, let’s not start by thinking we should shy away from conflict. It can be highly beneficial in certain circumstances, but it does need to be actively managed. Disputes can destroy teams when they're left to fester. These tips explain conflict management and how you can actively help parties who differ to reach a position of mutual understanding, even if you acknowledge that they’ll never really agree. Let’s start with some definitions. Managing conflict in the workplace is something we all do, whether we’re consciously aware of it. Conflict happens when two or more individuals (or groups) have different objectives, attitudes or opinions about the same thing. "Conflict management" is the term we give to how we deal with that. It’s what we do to identify the problem, to uncover the differences, and work out how we can address what’s going on. Many conflicts can be resolved with discussion, particularly if the needs and goals of the project or business are considered, but sometimes other factors are involved. Why Do We Need Conflict Management? In many workplace environments today, and on many project teams, the setup is that of a matrix structure. This means that the people on the team don’t directly work for you. This can be the perfect situation in many ways: you manage their tasks but you don’t have to deal with all the other human resources stuff like salaries, benefits, vacation time and so on. That gives you more time to focus on moving your project along to its ultimate goal. Having said that, matrix structures are rife with conflicts of loyalty, time, priority, or team. Knowing how to unpick all these is a helpful skill. We go looking for what hasn’t been done, chasing people and picking through their mistakes. We direct the work of people who report to others. We chase down answers and decisions, and this often involves escalating issues that could make others look bad to your project sponsor. The bottom line is that if you don’t know how to resolve conflict at work, your team will suffer from more conflict than is healthy. Debates won’t be moderated. Factions arise. Conflicts stop tasks from being completed when arguments aren’t resolved. Dealing with difficult stakeholders becomes your day job. If you don’t resolve problems, it ultimately affects your ability to deliver on your objectives. In the worst case, it can mean that your best people resign and that your team totally implodes. Many conflicts require only that you sit down and facilitate a conversation between people with different opinions. At other times, you might have to recognize when conflict is going to have a major impact on the project and act accordingly, perhaps raising the issue with your project board. The Thomas-Kilmann conflict mode instrument (TKI) is a way of working out your preferred style for handling conflict in any situation, not just at work. It's often used in workplace settings. As a tool, it’s really useful for understanding what options are available to you when you have an issue that must be dealt with. The TKI is a questionnaire that asks how you naturally react when you're faced with a situation where the opinions or concerns of two people don’t align. It helps you describe your own reaction and response when you come up against someone who doesn’t share your outlook. Assertiveness: How far do you take your own concerns at the expense of others? Cooperativeness: How far do you go to satisfy the other person’s concerns? These are two important areas of consideration. You have to understand how far you're prepared to go to protect and win your own position, and how much it matters to you to help the other person achieve what he wants. Ask your HR team if they have access to the Thomas-Kilmann assessment so you can take it. Find out your own personal style. The competing mode is sometimes also called "forcing." It's a very assertive style which is also uncooperative. It’s exactly what you would expect: You impose your opinion on the other person. He "loses." You're in a management role and are more senior than the other person. You control something in the situation, such as the budget or resource. You have expert knowledge of the situation that the other person doesn’t share. Telling someone else what to do. Issuing a mandate or directive. Rather than "resolving" the conflict, you’ve squashed it and enabled the project to move forward. You have a decision, but you’ve probably lost some friends by doing it. Use it with caution or when the situation really requires it for legal or safety reasons. Never descend into bullying at work. Accommodating is the opposite of competing. It’s unassertive and cooperative in that your interests are overlooked and you abide by the will of the other person. You shouldn’t always see this as “losing” or being self-sacrificing. Sometimes arguments aren’t worth your time or interest. Watch out if you use this too often, however, because might see you as "too soft” if you capitulate too frequently. This is where you don’t engage in conflict at all. It’s unassertive because you aren’t taking part in the discussion, and it's uncooperative because you're not helping the other person either. In fact, you’re doing nothing. This might sound terrible, but it can actually be effective when used in moderation and under the right circumstances. You haven’t actually managed the problem, just the initial manifestation of the conflict. You must still find time to address the issues. There’s a risk that the problem will get bigger and bigger if you wait too long. Imagine that two colleagues are arguing loudly and it's disturbing the work of other people in the office. You intervene and tell them that you’ll help them come to a resolution when they've both calmed down. You offer one of them the chance to cool off in your office until that time. Postpone the discussion until a better time or situation. Move away from a threatening situation. Collaborating is an assertive way of resolving problems and it’s highly cooperative. You don’t avoid the conflict — you dive straight in, working together to unpick the issues and to get to a point where both your requirements are met. Approaching the situation in a really pragmatic way can help build trust with your team. Let's say that Marketing wants the product to launch in March. IT wants a new starter to join the team before they begin work on the product launch. They go over the Gantt chart together and use scheduling techniques to ensure that the new starter can fully be part of the team and still get the product launched on time. Conflict resolution techniques in this mode include discussion and mediation. Compromising is moderately assertive and moderately cooperative. It’s a halfway position that's commonly used, and of course, you've compromised on situations in the past. You don’t get exactly what you want, and neither does the other person. Instead, you come to an amicable solution that you can both agree on. What’s Your Conflict Resolution Style? 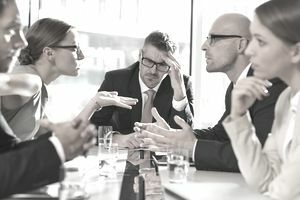 The great thing about understanding where you sit on the TKI is that you understand your preference for resolving conflict in the workplace — and in other places, too. This gives you a head start in identifying what might be the best approach to use for the particular situation you find yourself in. You have a personal preference, but you're not stuck responding the same way in all situations. Walking away might be the most appropriate course of action in some cases, so you’ll choose to avoid it. In others, a compromise might be the fastest way to an acceptable path around the impasse. You might choose to use other techniques at other times. The most important thing to remember is that workplace conflict is going to happen, so having a few techniques to draw on gives you options when you're faced with a difficult situation. Knowing your options gives you confidence and that can help you sort out disputes so everyone can get back to work.